You may love seeing the color coordinated and organized pictures of linen closets on Pinterest and wonder how to organize your home like that too. 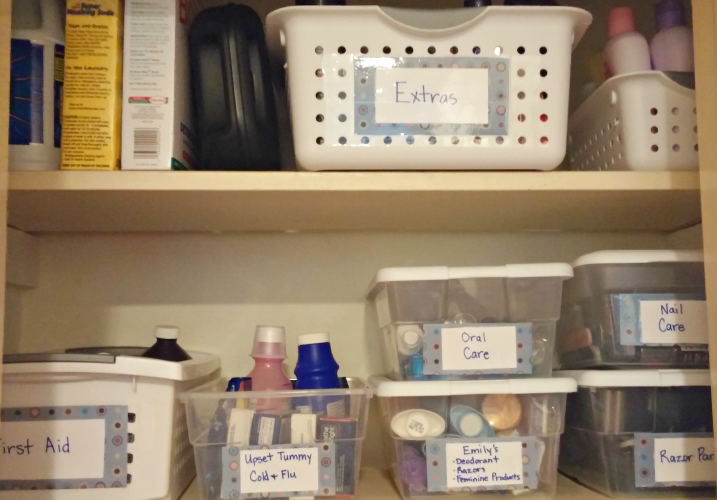 It may seem like in order to have an organized space like those, you would need to spend lots of money on fancy containers and labels. But the truth is, you don’t have to spend big bucks to get a functional, organized space. I recently organized my linen closet. I don’t have a before picture, but just imagine a closet overflowing with accumulated junk from the last seven years. It scared me every time I opened the door! 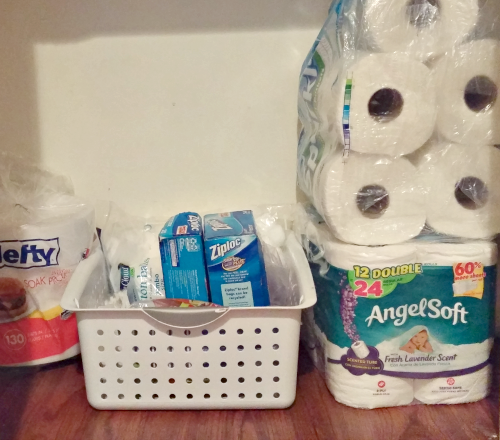 Being a cheapskate, I didn’t want to spend any money on my linen closet, so I did three things that helped me accomplish my goal. You can do these things too for an organized space! Before you can organize any space, you must get rid of items that you no longer use. There is no point in storing what you don’t need. Empty everything from the space you are organizing. Go through each item and decide if you really need it or not. Either donate or throw away any item that you do not use. By all means do not put anything back in your space if you won’t ever use it! If you have a hard time letting go of things, check out the book Make Room for What You Love* by Melissa Michaels. It had such an impact on my thinking about decluttering! Another book I love is Unstuffed* by Ruth Suokup. She shares inspiration for getting rid of all the things that weigh us down and clutter our homes and lives. I highly recommend it! For my linen closet, I went through every single item in the closet, shelf by shelf, and took out what we weren’t using or planning on using. In other words, junk that I was simply storing! I took out three old raggedy towels, two sheet sets that we never really liked and hadn’t used in years, curtains that I have no use for, a baby bathtub, cleaning supplies, an old shower curtain, and some empty plastic tubs. All of that made room for not only my linens, but also toiletries, medicine, and paper goods. I also got rid of all expired medications and toiletries that we will never use. Once you have decided what items you are keeping, it is time to start organizing! Divide everything up into categories and label them. Putting like items together is essential for any organized space. That way you know exactly where something is rather than spending time searching for it. 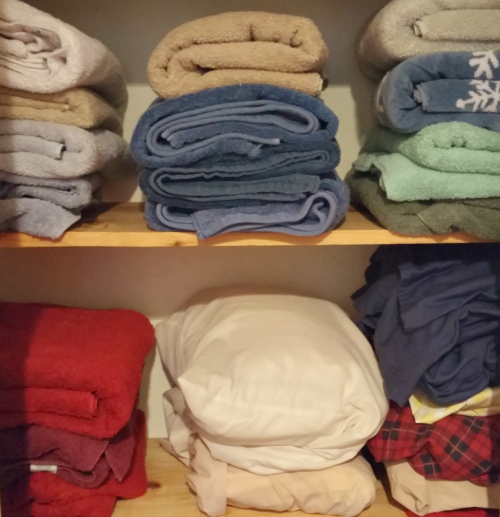 For my linen closet, I put all of the towels on one shelf and the sheet sets on another shelf. Each shelf has a designated job. That way the towels and sheets don’t get mixed up. All of my toiletry items are on one shelf as well. 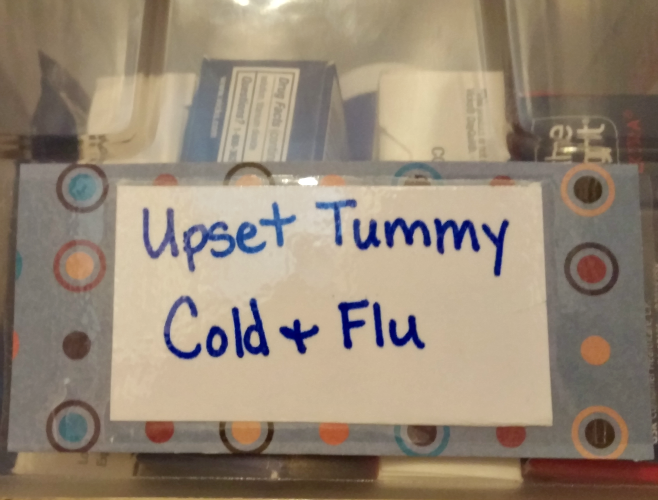 I divided the medicine into two categories based on our family’s needs: First Aid and Upset Tummy/Cold and Flu. I used plastic shoeboxes* that I already had on hand, but you can get them really cheap at the Dollar Tree! The boxes have oral care, nail care, razors, and my personal products. Chances are you already have containers lying around your house that you can use. Before you throw out plastic coffee canisters, baby wipes containers, cardboard shoe boxes, or glass jars, think about a way that you could use those containers to corral items. Wrap a small cardboard box with butcher paper to hold items that you need out in plain view. Clean out the wax from old candle jars and use the jars to hold small items in the pantry or on a desk. Use shoe boxes to divide spaces up in drawers. I was able to gather several containers from around my home that I had collected throughout the years. Whenever I buy new containers, I always get white rather than other random colors. This helps create a cohesive look and I can change things around easily. My labels are made from a piece of scrapbook paper and a 3×5 card. I used packaging tape to adhere the label to the containers. You probably have those items in your home too and can make your own labels! Don’t wait for expensive containers or fancy labels, you can organize any space for free today! If you wan motivation for maintaining your organized space, read The Only Thing You Need to Stay Organized. So smart! I really need to do that. It's so hard for us to organize our closets since we haven't actually had time to look through our closets and organize them. I hope you are able to organize your closets. I will say that it took me a few days by working a little at a time on this project. But even working 5 minutes here-and-there can make a difference! Great tips! I love the Container Store and it's always tempting to buy all the things but it really is best to use what you have. I've never been to the Container Store, but it sounds like a store I would be tempted to buy things in also! I love using what I already have as much as possible. Great ideas! I'm on a kick right now re-organizing my closet. Thanks, Tif. I love getting the re-organizing kick! I'm sure you will love the end result! Thank you, for hosting, Lindi! It is easy to think that a space has to have the perfect containers, but I have learned that it just needs to be functional. Thank you for the feature, I will definitely stop by!